It takes under two hours to drive from the Clare Valley to the Barossa Valley (to the south-west). The drive between these valleys is across miles of rolling wheat farms. It is a beautiful, peaceful transit. The Barossa Valley is Australia’s most famous and significant wineland. There are 170 wineries here and (given the much warmer climate than Clare) – the focus of their efforts is Cabernet Sauvignon, Shiraz, Mourvedre (known here as Mataro), and Grenache. This valley is big and the vineyards are big and wine production is big. This is where Penfolds (established in 1844) is located. Many of the vines in this valley are 100 to 150 years old. 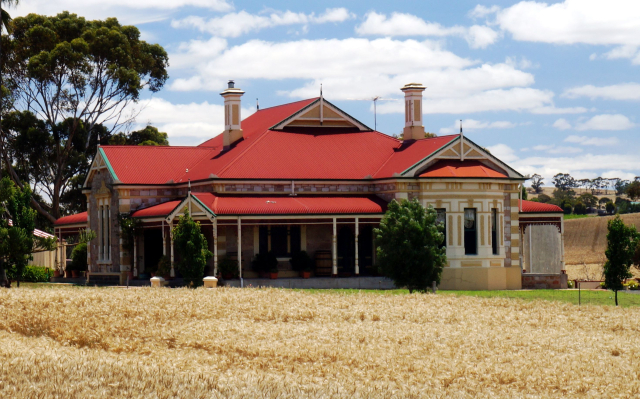 Compared with staying in quiet Clare, Tanunda is busy and bustling.